Want to add about 150HP and get an average of 5 MPG more in fuel mileage out of your LMM Duramax? If emissions aren’t a concern for you, then adding the HP and mileage is as simple as deleting the DPF and EGR from your truck. Removing these highly restrictive and failure-prone systems allows your truck to breath much easier and run much more efficiently. Below I’ve compiled the list of required parts that you will need to delete the DPF and EGR systems on your LMM Duramax engine, as found in the 2007-2010 GMC/Chevy diesel trucks. When adding performance or deleting systems on your LMM, the first thing that you’re going to need is a good tuner. There are a lot of tuners that can help with different tunes for fuel consumption, horsepower and towing modes, but there are only a couple options for race tuners that are able to unlock your truck for the real power and reliability of deleting the DPF/DOC and EGR. The Mini Maxx race tuner is part of the next generation of diesel downloaders from H&S that offer everything a diesel owner could want, all in one high-tech unit. Exclusive to H&S Performance, the Mini Maxx offers the flexibility of shift-on-the-fly tuning, as well as giving you the ability to monitor vital engine statistics at a glance. The full color, high resolution screen allows the user to view up to four parameters at one time. The new ATLAS exhaust by aFe is engineered to perform in the most extreme environments. This system is constructed from mandrel bent 4" aluminized steel tubing for maximum flow, increased horsepower, increased torque and lower EGT's. The 2-piece tailpipe and bayonet style hangers provide a hassle-free installation. To provide a leak-free seal, OE style band clamps are used that offer a 360 degrees sealing area. 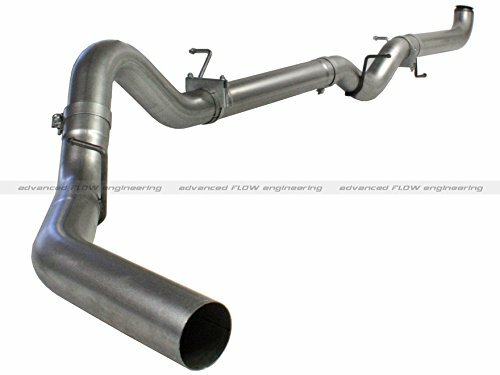 Systems are available in 4" down-pipe back without muffler. ATLAS exhaust systems are the perfect combination of performance, fit and value. ATLAS exhaust systems utilize a 2-piece tailpipe design for a perfect fit by allowing adjustability at the tailpipe section. All systems use factory mounting locations providing stability and hassle-free installation. High quality OE style band clamps are used for a complete 360 degrees sealing surface. OE style bayonet hangers are used to maintain a stable pipe location during high vibration and high heat conditions. The Bayonet tip holds the hanger bushing in place for an OE style fit that does not change with time. ATLAS exhaust systems are constructed of mandrel bent 4" aluminized steel tubing for maximum flow. Smooth transition bends allow for low turbulence, increasing horsepower, torque and lowering EGT's. 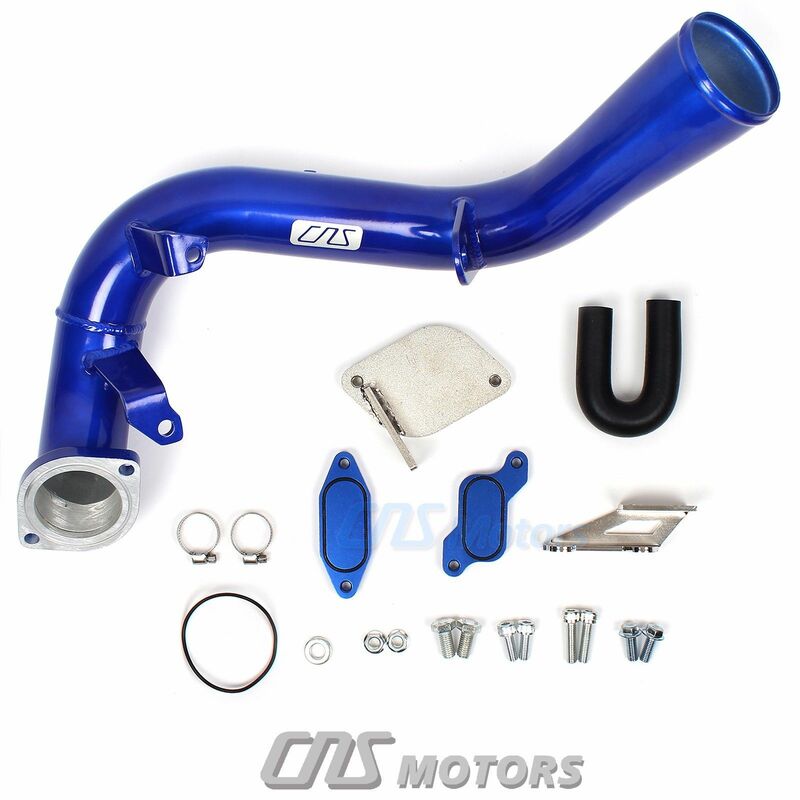 This all inclusive EGR delete kit includes the parts you'll need to perform the delete, along with an upgraded intake elbow tube to clean up and simplify your engine bay while allowing for much better flow. Completely replace the EGR system with no other parts required. Does not Require Removal of Turbo, Intake Manifold or Up Pipe to install. Hey Jim, thanks for the kind words! As far as returning to stock for inspection, on the tuner side it is actually pretty simple to do. Most good delete-capable tuners, such as the H&S MiniMaxx, will allow you to load a base or factory tune for reverting the deletes. It’s as simple as clicking a few buttons. For the exhaust side, it’s a little more tricky as it would be pretty easy for an inspector to see that there is now a straight pipe exhaust in place of the factory restrictions. I don’t know how mechanically inclined you are, the exhaust swap is not exactly a really hard job once the exhaust has all been apart once, but you would have to get under there and put the factory downpipe and sensors back in for it to pass a visual. For your question about the EGR delete; a full delete eliminates the restrictive intake and grid heater, and removes the EGR cooler. The factory EGR cooler is somewhat prone to leaking, so this another great benefit to removing the whole EGR system. Thanks Jeff, the 1st time I’ve been able to get a full answer, other than just an opinion. Mechanical issues is not the problem, working on a diesel for the 1st time is. I will be placing an order for the DPF replacement pipe & tuner, however I really wish I didn’t need to replace the EGR. Re-installing the DPF wouldn’t be bad once a year to pass an inspection, but re-installing the EGR is a job. I’ve already removed, cleaned, then re-installed with a blocker plate. Could I achieve the same result by leaving the EGR with the blocker? Then once a year I could just remove the blocker and re-install the DPF? Before I proceed, I have one more question; the start of this journey was when the ck engine light came on indicating an EGR problem. Since blocking the EGR & removing the PCV valve, I never cleared the code, so the light is still on. When I get the tuner you recommend, I’m sure it will allow me to clear the code, but to pass inspection I know I’ll need to re-install the PCV valve, but will I also need to remove the EGR blocker? Glad I can help Jim! Since you already have the blockoff plate for the EGR installed and have cleaned the system, I would probably stick with that setup instead of changing to the full EGR delete kit. The MiniMaxx Race version linked up above will allow you flash a custom tune to remove the codes for the DPF and EGR elimination, however since your state requires a plug into the engine computer for emissions testing, in addition to reinstalling the factory exhaust you will have to remove the EGR block off and flash your factory tune back when taking it in for them to test. I don’t know which block off plate you have right now, but one like this is the best kind for removing for emissions because the bolt holes are actually slots, allowing you to simply loosen the bolts to slide it in and out, which is much faster and easier. Make sure you drive the truck a few times or about 100 miles after reverting to the factory stuff before you take it in for testing, so that the computer has time to relearn the correct parameters. Jeff, will the Mini Max, you recommended, allow you to read and clear any engine codes that might come up? Also, can you just disable the EGR and achieve the same results as either blocking, or deleting? I’ve read where people say they disable the EGR and then unplug, but that just seems too easy. Can the Mini Max be upgraded, or changed over time, or is that just possible with the EFI live? I thought the Mini Max was EFI live, but was told that it isn’t. Yes it will, and more importantly it will allow you to load a tune that doesn’t require the EGR and DPF systems to be installed, which will keep those codes from coming back. You can just unplug the EGR and load a tune that deletes it, but the downfall to doing that is that under wide open throttle there is a chance that the valve can blow open and exhaust gasses could leak into the intake. That’s where the blockoff plates come in, they keep that leak from happening. The MiniMaxx Race version is the recommended tuner for someone that wants an easy, straightforward way to delete their truck. This is because it is basically the only LMM tuner that comes with the necessary pre-loaded delete tunes out of the box. It does support custom tunes through a software package called MCC if you want to get a little more involved with fine tuning in the future. If you want to get into higher power and more flexibility, and really drill down to a perfect tune, then an EFI Live setup will most definitely be better. It won’t be delete-capable out of the box and you will have to find a tuning technician to create a custom tune for your truck with the deletes and power level that you want, but it does offer a lot more tuning options. If you go the EFI Live route, the best package for that would be the Gorilla EFI Live Autocal tuner as it includes one custom tune from the guys at Gorilla. Thanks, that makes sense and for me, the mini max should be fine. After removing the blocker and installing the PCV I ran the truck for about 100 miles, but on the way back the truck went into reduced power mode. I made it back to our shop, remover the cover to the air box, thinking the K&M might be dirty; but it wasn’t. Drove it again and didn’t have a problem. Went to the local auto parts store to have them plug in and read the codes. I told the guy that I had an EGR code, so I removed and cleaned and wanted him to re-set. He gave me a long speach about liability and said he wasn’t supposed to, but he could tell me what buttons to press and I could do it. Nice guy! The following were the codes; P0113, P2463, P02E8, P0401 & P1448. I was able to delete all but the P02E8 & P1448. The hand held unit couldn’t delete those (2) codes. The guy didn’t know why, so I went on my way. If it’s something to do with the DPF not being cleaned while I had the blocker installed, will it take of itself, given a little driving time? I’m not sure just what the other code is, but imagine it’s probably related. I’m going to order the Mini Max, do you think that will clear everything, or could I have some issue that will need to be addressed? You should be fine, the P1448 code probably only popped up because the truck needs to run through a regen. The P02E8 code is for the intake airflow valve position sensor I believe, first thing on that I would check and make sure that the sensor has a good connection, it should be operational if you returned the systems to stock. A non-emissions tune will get rid of the ability for the computer to trip those codes in the future, once you have your deletes reinstalled. Jeff, going back to a previous question, I installed an EGR blocker plate and removed the PCV with a re-route. I drove the truck that way for a couple of months, but now I need to pass an inspection. I removed the blocker & re-installed the PCV valve. Soon after I made the changes the truck went into Reduced Power Mode. You mentioned that I should drive about 100+ miles so the re-gen process can clean the DPF. It only went into reduced power mode a couple of times and I’ve driven about 200 + miles, but now it just started to go into the reduced power mode within a few miles after starting the truck. Do you think it’s the DPF, or should I look for something else? If it is the DPF, can that be removed and cleaned? Jim, are you getting any more OBD codes? There are a few things that can put the truck into reduced power mode, but if you have codes showing up that can help to narrow it down. A DPF technically can be cleaned, but it has to be cut open and taken apart to do it correctly, generally it’s not worth the effort vs swapping in a used one. I wouldn’t worry about tearing into that yet until you confirm it’s clogged, which I’m not completely sure is likely at this point. If there are no codes popping up, I would probably start by disconnecting the battery for an hour or so to reset the ECM parameters. Also, I would check any electrical connections on sensors, etc that might’ve been disturbed when putting the EGR and PCV back. Make sure to check it over for any vacuum leaks and I would also try cleaning your MAF sensor to see if that helps.